Roche Cobas 4800 With x480 + z480 Molecular Diagnostic Testing CT/NG/HPV PCR . New Life Scientific, Inc. This system is in excellent cosmetic condition and incredibly clean when acquired from a working environment. The x480 and z480 have minor signs of use that may reflect age, but there is no notable cosmetic damage. This instrument is warranted functional and is protected by our 90-day warranty. Our in-house technician inspected and tested this Cobas x480. 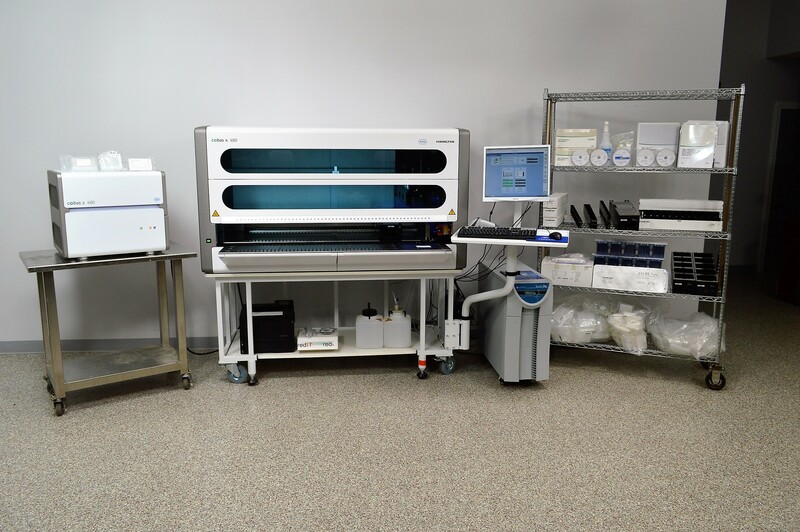 The sample prep Cobas x480 connected with the PC and requires weekly maintenance that is performed within the software; daily maintenance is an option. The technician confirmed that the maintenance was performed during the evaluation. The brief check of all internal systems, robotics and pressure checks were passed, and the O-rings on the multi-channel pipette head are in good condition. The PC to instrument communication was seamless and the software is easy to navigate. -Roche needs to professionally install this system and configure the z480 with the software. The technician lost the IP address configuration and was unable to connect the analyzer with the PC. Prior to the lost connection, the z480 warmed and the sample drawer opened. The technician contacted Roche technical support and Roche explained the professional installation includes an evaluation to ensure that this product meets the manufacturer's specification. We were unable to confirm if this instrument was professionally 'un-installed' and the manufacturer expressed the importance of their intervention which is left to the discretion of the customer. This system is in excellent cosmetic condition and includes the PC workstation and accessories. This product was manufactured between 2014 & 2015 and was recently acquired from a liquidated genetics laboratory who lost a major contract. Please see the description for all included components, testing, and technical recommendations.